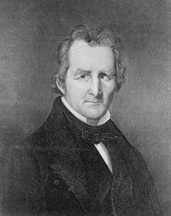 TAPPAN, Benjamin, a Senator from Ohio; born in Northampton, Mass., May 25, 1773; attended the public schools; apprenticed as printer and engraver; traveled to the West Indies; studied painting with Gilbert Stuart; studied law; admitted to the bar in Hartford, Conn., and commenced practice in Ravenna, Ohio, in 1799; member, State senate 1803-1805; moved to Steubenville, Ohio, in 1809 and continued the practice of law; served in the War of 1812; held several local offices; county judge; judge of the fifth Ohio Circuit Court of Common Pleas 1816-1823; presidential elector on the Democratic ticket in 1832; United States district judge of Ohio 1833; elected as a Democrat to the United States Senate and served from March 4, 1839, to March 3, 1845; chairman, Committee to Audit and Control the Contingent Expenses (Twenty-seventh and Twenty-eighth Congresses), Committee on the Library (Twenty-seventh Congress); censured by the Senate in 1844 for breach of confidence for passing copies of a proposed treaty with Texas to the press; died in Steubenville, Jefferson County, Ohio, April 20, 1857; interment in Union Cemetery. American National Biography; Dictionary of American Biography; Feller, Daniel. Benjamin Tappan: The Making of a Democrat. In The Pursuit of Public Power: Political Culture in Ohio, 1787-1861, edited by Jeffrey P. Brown, and Andrew R.L. Cayton, pp. 69-82. Kent, OH: Kent State University Press, 1994; Ratcliffe, Donald J., ed. The Autobiography of Benjamin Tappan. Ohio History 85 (Spring 1976): 109-57.